When hailstones strike aluminum siding, it can create what is called cosmetic hail damage. Depending on the size of the hailstones, the strength of the winds and other factors, the damage may consist of obvious deep impressions or more subtle dents, only visible in certain light. Under this certain light (when the sun reflects upon your house at a certain angle) a house that looks normal can suddenly look ravaged. Hailstones can also cause damage to different types of roofing systems. Hail can damage a cedar roof by causing small splits in the wood shingles. This can greatly diminish the life of the roofing structure. Asphalt roofing can get what are often called "bruising marks." These marks can lead to problems in the future if left unrepaired. 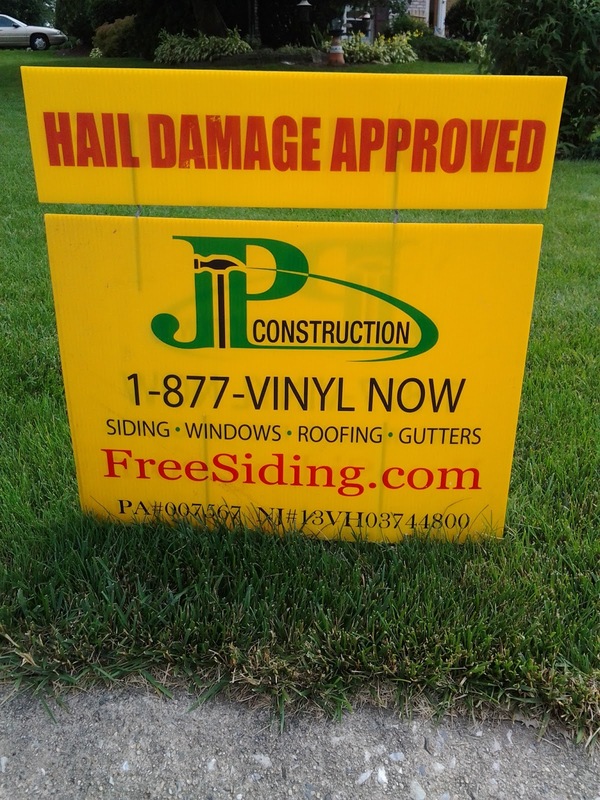 If you have seen JP Construction signs in your area or you have received a flyer or letter from us and you own a home with aluminum siding, or cedar or asphalt roofing, we recommend that you call us right away to schedule a free hail damage inspection. 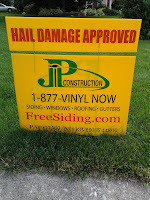 During the free hail damage assessment, a representative from JP will thoroughly inspect your siding and or roof. Assuming you qualify, we will then sit down with you and go over everything that you need to know. We will discuss the potential scope of work and we will show you the many colors and styles of siding and roofing that we offer. We will explain to you how the process works, what the general time frame for the project will be and we will answer all of your questions. Call us now to schedule your free inspection and begin the process for yourself of obtaining cost-free, brand new siding and/or roofing for your home. As with all insurance claims, there is only a certain amount of time that you have to act. Therefore, we urge you to call us now! REMEMBER: You don't want to get left behind and you don't want to receive an unfair decision. Therefore, we recommend that you call us BEFORE you call your insurance company and that you call us right away! IMPORTANT: Not repairing damage may lead to future problems of the functionality of your exterior systems. Secondary damages caused by not repairing the primary damages may not be covered.